The Short-tailed Albatross Phoebastria albatrus* once bred in huge numbers on at least eleven uninhabited remote islands in subtropical waters west of the Izu-Bonin islands chain, south of Japan. These long-lived birds do not reach full maturity until about 12 years old; away from the breeding islands they ranged widely throughout the north Pacific Ocean (Hasegawa 1984). Here in California, it was once considered “fairly common at sea, irrespective of season” and thought to be the commonest albatross inshore as indicated by the predominance of its bones in certain shellmounds, such as at Pt. Mugu, Ventura Co. (Grinnell & Miller 1994). Short-tailed Albatross (formerly called “Steller’s Albatross”) was considered "common" in Monterey Bay in the fall/winter of 1894-1896 and was often seen from shore (Loomis 1896-1900). A number of California specimens were taken in this period, presumably including the mounted adult (right; photo © Gary Lester) from the Clarke collection, now at Eureka High School, Humboldt Co. (no data with specimen). Grinnell & Miller (1944) give the last specimen as 3 Apr 1898 at San Pedro, Los Angeles Co. It was then last reported in the field from Pt. Pinos, Monterey Co., by R. H. Beck on 12 Dec 1904, when he saw an albatross "that might have been this species" (Beck 1910). At the turn of the 20th century, the species was almost extirpated by plume hunters on its volcanic nesting islands. It has been estimated that 5 million albatross were killed here from 1887-1902 until a volcano in 1902 wiped out the village of the plume hunters (Harrison 1979). Many thought it extinct by World War II (Austin 1949). But a tiny colony was discovered in 1951 on the volcanic ash slopes of Torishima in the Izu Islands. Under conservation efforts by the staff of a small meteorological station there, numbers grew. Adult numbers reached 50 by 1965 and to 130 by 1978; young were produced each year since 1960 (up to about 25 young fledged by 1980; Hasegawa 1984). A second small colony on an inaccessible cliff ledge on Minami-kojima in the Senkaku Island was found in 1979, and breeding confirmed in 1988 (population of 75 birds and 15 breeding pairs in 1991; Hasegawa 1991). The most recent estimate is apparently about 500 adults and perhaps 1100 birds in all (U.S. gov’t estimate 1999). One-two birds have been present off-and-on at Midway Island for two decades, with a single incubating individual found in November 1993, but the egg didn’t hatch (Harrison et al. 1984, Richardson 1994). On Torishima, nesting conditions have been improved by planting native grass to stabilize breeding sites; active banding operations began within the last decade. 1. 28 Aug 1977, about 90 mi. west of San Diego, Keith C. Richards saw an all-dark immature with Black-footed Albatross P. nigripes but “appreciably larger .. and had a heavy-looking bill” (Unitt 1984). This bird was not photographed, nor do we have an exact location. Ninety miles west of San Diego is closer to San Nicolas I., Ventura Co., than any other point of land. 2. 2 Dec 1983, first sighted at 35°30'N, 122°11'W, off Pt. Piedras Blancas, San Luis Obispo Co. This all-dark immature followed the research ship Bob Pitman was on for nearly an hour and into Monterey Co. waters at a point about 60 nmi. SW of Cape San Martin. This bird was photographed (right; © R.L. Pitman) and appears to be in juvenal plumage. Although it is difficult to say for sure, there do not appear to be any signs of molt in the remiges and thus is seems likely the bird was in its first year of life. 3. 3-5 Nov 1985 over Cordell Bank, Marin Co. Rich Stallcup discovered this juvenal-plumaged bird from a chartered boat where it came into popcorn (Stallcup 1990); a “chase” trip organized two days later refound it (but another “chase” two days after that did not). Photographs have appeared widely; one of my 5 Nov photos is shown (right; © D. Roberson) and another is on my Albatross page. Close examination of some photos showed it to be banded, presumably as a fledgling on Torishima, Japan. It had an all-pink bill without a bluish or dark tip. I also like this photo because it gives one a sense of just how rough the sea was the day of the first "chase" trip. 4. 18 Apr 1987 about 20 nmi. W of Cypress Pt., Monterey Co. Another all-dark immature was seen by David G. Ainley but it was not photographed. 5. 28 Aug 1998 about 20 nmi W of Bodega Head, Sonoma Co. All all-dark juvenal-plumaged bird, also banded, was photographed by Guy Luneau, Dan W. Nelson, and others. Nelson’s photo is on-line on Joe Morlan’s web site. It appears have an all-pink bill without any hint of a bluish or dark tip, and is in wing molt. Thus it should be older than one year. 6. 26 Oct 1998 over Cordell Bank, Marin Co. A fresh-plumaged juvenal bird whose pink-bill has a bluish tip (and thus clearly not the August bird in the same area) was photographed by Bert McKee and others. McKee’s photos are on-line on Joe Morlan’s web site. 7. 21 Dec 1998 in Monterey Bay just over 3 mi WNW of Pt. Pinos, Monterey Co. Found by Steve Howell & Richard Ternullo, Richard’s photo is shown (right; © R. Ternullo). It was a fresh-plumaged juvenal bird whose pink bill has a bluish tip. 8. 1-10 May 1999 from shore between Pebble Beach and Pt Pinos, Monterey Co. 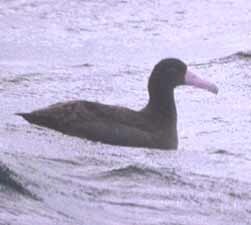 This all-dark pink-billed bird was scoped from shore during during high winds which pushed many Black-footed Albatross close to shore each afternoon, permitting comparison. First found by Craig Hohenberger and others on 1 May, it was seen again on 9 May & 10 May (details on my ID of silhouetted dark albatross page). This was the first Short-tailed Albatross seen from shore in 95 years. 9. 7 Aug 1999 about 15 nmi. W of Cypress Pt., Monterey Co. Seen on a chartered boat trip that included Ryan Chornock, Bert McKee, & Debi Shearwater, it was photographed by several, including a video by Les Lieurance that is on Joe Morlan's web site. 10. 8 Jan 2000 over Cordell Bank, Marin Co. An all-dark juvenal from a chartered boat trip by Dan Nelson and others. Here are two photos (below; @ Dan Nelson) of that bird; Dan's lefthand photo is a remarkable "three albatross" shot! 11. 15 Jan 2000 about 26 nmi. WSW of Pt. Buchon, San Luis Obispo Co. This fresh-plumaged juvenal, showing a pink bill with a bluish tip, was first found by me (Don Roberson) and Tom Edell. It showed no signs of any wing or tail molt; a photo is shown (right; © 2000 Norwood C. Hazard). The location was over the Santa Lucia Escarpment, an upwelling site that attracts albatross. On this trip we had the completely unique experience of seeing only three albatross: one each of three different species! [Short-tailed, Black-footed, Laysan]. With now ten recent sightings, half of them within the last 13 months, we can look forward to additional sightings in the future. All recent observations have been of all-dark immatures; all those photographed prove to have been in juvenal plumage. There has been slight variation in bill color at the tip of the bill, but the huge long bright pink bill dominates one’s first impression of this great bird. Observers should be aware that some old or pale Black-footed Albatrosses can have pinkish bills and have been mistaken as this species. One photographed 20 Apr 1978 about 50 miles WNW of the Monterey Peninsula was published as a “Short-tailed” (Helm 1980) was later proven to be misidentified (Roberson 1980). 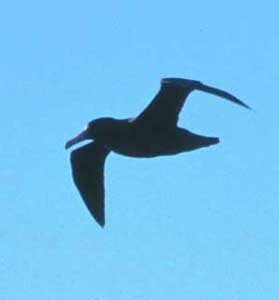 Identification criteria is given in Roberson (1980) and to some extent on my ID of silhouetted dark albatross page. The very heavy and long bill is a critical point in addition to its color. Some albatross species retain juvenal remiges for a year or more (Murphy 1936); I have as yet been unable to determine when Short-tailed Albatross begins post-juvenal molt. It may be that such young birds wander the most widely. It may be that the first post-juvenal plumage is all-dark or mostly dark, but such birds should be in wing molt which presumably occurs year-round until suspended during nesting many years later. Hasegawa’s photo of an almost-all-dark immature in Harrison (1987) show a bird in primary molt and with slight pale whitish patches beginning in the center of the greater secondary coverts along with a bit of white in the face. Roberson (1980) sketches an approximate plumage sequence based on Japanese literature, and this general sequence is followed in Harrison (1983). Details of recent Alaskan observations, including photos of immature birds older than juvenal birds, is on line HERE. It is also noted that a sighting from 17 Feb 1946 about 70 mi. w. Pt. Año Nuevo, San Mateo Co., was published as a “Short-tailed” (Traylor 1950). 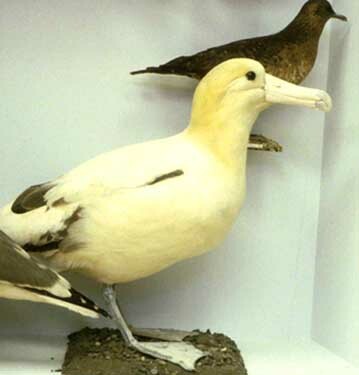 This was a white albatross (and thus an adult Short-tailed if correct) but published details did not eliminate several species of mostly white albatross from the South Pacific (and there are North Pacific records of Shy Diomedea cauta and Wandering D. exulans albatrosses which now need to be considered). 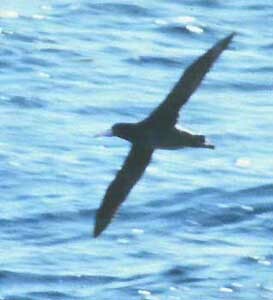 * = Nearly all the literature uses Diomedea albatrus for Short-tailed Albatross, but the 7th ed. A.O.U. 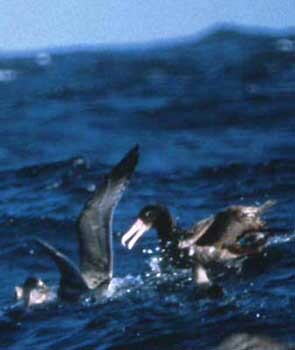 Check-list (1998) resurrected Phoebastria Reichenbach for the three North Pacific albatross. Austin, O. L., Jr. 1949. The status of Steller’s Albatross. Pacific Sci. 3: 283-295. Beck, R. H. 1910. Water birds of the vicinity of Point Pinos, California. Proc. Cal. Acad. Sci., 4th ser. 3: 57-72. Grinnell, J., and A. H. Miller. 1944. Distribution of the Birds of California. Pac. Coast Avifauna 27. Harrison, C. 1979. Short-tailed Albatross. Oceans 12 (5): 24-27. Harrison, C. S., M. G. Naughton, and S. I. Fefer. 1984. "The status and conservation of seabirds in the Hawaiian Archipelago and Johnston Atoll" in Status and Conservation of the World's Seabirds (J. P. Croxall, P. G. H. Evans, and R. W. Schreiber, eds.). Internat. Council for Bird Preservation, Tech. Publ. 2. Harrison, P. 1983. Seabirds: an Identification Guide. Boston: Houghton Mifflin. Hasegawa, H. 1984. "Status and conservation of seabirds in Japan, with special attention to the Short-tailed Albatross" in Status and Conservation of the World's Seabirds, J. P. Croxall, P.G.H. Evans, and R. W. Schreiber, eds. ICBP Tech. Pub. 2. Hasegawa, H. 1991. Red Data Birds: Short-tailed Albatross. World Birdwatch 13(2): 10. Helm, R. C. 1980. A Short-tailed Albatross off California. West. Birds 11:47-48. Loomis, L. M. 1896-1900. California Water Birds: Monterey and vicinity. Nos 1-2 & 4-5. Proc. Calif. Acad. Sci., 2nd series 5: 177-224; 6: 1-30; 3rd series 2: 277-322; 2: 349-363. Murphy, R. C. 1936. Oceanic Birds of South America. Vol. 1. Amer. Mus. Nat. Hist., New York. Richardson, S. A. 1994. Status of the Short-tailed Albatross on Midway Atoll. ‘Elepaio 54. Roberson, D. 1980. Rare Birds of the West Coast of North America. Woodcock Publ., Pacific Grove CA. Stallcup, R. 1990. Ocean Birds of the Nearshore Pacific. Pt. Reyes Bird Obs., Stinson Beach, CA. Traylor, M. A. 1950. A record of the Short-tailed Albatross. Condor 52: 90. Unitt, P. 1984. The birds of San Diego County. San Diego Soc. Nat. Hist. Memoir 13.